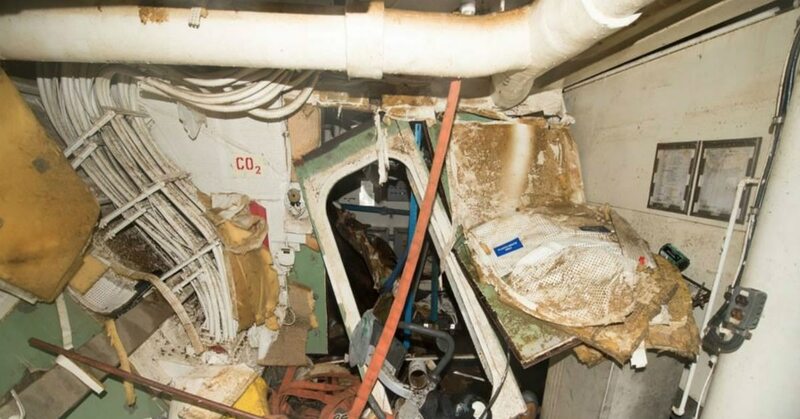 A junior officer who oversaw navigation of the destroyer Fitzgerald when it collided with a hulking merchant vessel on June 17, killing seven sailors, pleaded guilty to a dereliction of duty charge during a special court-martial Tuesday. Lt. j.g. Sarah Coppock received a punitive letter and will forfeit half a month’s pay for three months as part of her sentence, according to a Navy statement. “The Navy will not accept complacency, negligence, or other behaviors contrary to its core values,” the release states. As part of her pretrial agreement, Coppock waived her right to an administrative discharge board, where a panel would have decided whether she would stay in the Navy or not. Navy spokesman William Speaks declined to say Tuesday what Coppock’s final fate in uniform will entail. “As of right now, she remains on active duty,” he said. The Navy has released the first details regarding three junior officers charged for their alleged roles in the destroyer Fitzgerald’s collision with a merchant vessel last summer, an incident that killed seven sailors. Coppock was serving as officer of the deck, or OOD, at the time of the collision, and was accused of failing to follow the commanding officer’s standing orders, as well as international navigation rules. She was supposed to communicate with the ship’s combat information center, report ship contacts to the skipper, operate safely in high-density traffic and warn the crew of imminent collisions, according to her charge sheet. Navy officials declined to provide a copy of Coppock’s plea deal or any statement of fact for the case. The Navy has also refused to make public any of its investigations into the disaster, but a review released last fall found the OOD to have made no attempt to contact the commercial ACX Crystal via radio, and did not attempt to maneuver to avoid the Crystal until a minute before the collision. The Fitz’s crew had no warning before the hulking Crystal plowed into her starboard side. The impact flooded sailors’ living quarters in less than a minute, according to the review. The ship’s captain, Cmdr. Bryce Benson, was asleep, and the Crystal’s bow punched into his quarters. He was injured and rescued by crew members as he clung to the side of the ship. He faces an Article 32 hearing to determine if he will be court-martialed later this month. Two juniors officers will face their own Article 32 relating to the Fitz disaster on Wednesday at the Navy Yard in Washington.